Los Angeles-based Celtic rockers Flogging Molly will be making an early St. Patrick’s day stop at the Congress Theater next weekend - Friday, March 11th and Saturday, March 12th - as part of their 7th Annual Green 17 tour. 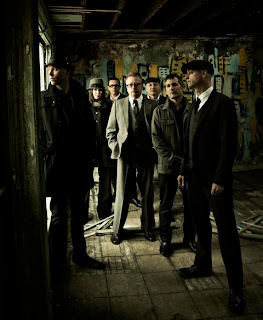 Flogging Molly fans anxiously await the Green 17 tour each year as the festivities have grown into near legendary status. The band's blend of traditional Celtic sounds, hard-edged punk and thoughtful lyrics, combined with the sheer power of their live shows, have garnered a loyal following that matches their energy night after night. Tickets for the show can be purchased in person at the Congress Theater box office with no service changes or online here. To purchase tickets for other dates, please visit Flogging Molly’s website. The band is currently touring in support their upcoming album The Speed of Darkness, which is set to be released on May 24th on Side One Dummy Records. You can download the first single, “Don’t Shut ‘Em Down,” for free.